The following appeal for solidarity was today made in a letter to the Guardian. It can be signed here. 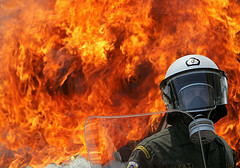 The people of Greece face an unprecedented economic and political crisis (Violence grips Athens, 13 February). They are being driven to poverty and mass unemployment by the demands of the so-called Troika. Hospitals in Greece are running out of medicines, nearly half of all young people are unemployed, workers in some sectors have not been paid for months, the living conditions of pensioners are being severely attacked, and many people are forced to resort to soup kitchens or scavenge from rubbish dumps. Now the Troika demands a cut of 23% to the minimum wage, the sacking of tens of thousands of public sector workers and further cuts to pensions which have already lost nearly 50% of their value. International capital is asset stripping an entire country and ripping apart its social fabric. Greece is at the cutting edge of the austerity measures that are being introduced across Europe. All the evidence shows that while these measures may protect the interests of the rich, they just make matters worse for the majority of the population. What happens in Greece today we will see inPortugal tomorrow and in Ireland the day after. In Britain, the coalition government is pursuing similar measures which will see workers’ earnings reduced, see them working longer for a smaller pension, and the NHS dismantled, along with other public services. Mikis Theodorakis, famous Greek composer of Zorba’s Dance, and Manolis Glezos, veteran resistance fighter against the Nazi occupation, have issued a call for a European Front to defend the people of Greece and all those facing austerity. We have decided to support this call and work with trade unions, campaigns and parties across Europe to establish a European Solidarity Campaign to defend the people of Greece. We will organise solidarity and raise practical support for the people of Greece; they cannot be made to pay for a crisis for which they are not responsible. Posted in: Earnings, Economy, Employment, Europe, International, Macroeconomics, Public Spending, Trade Unions. Is this a united union front against unelected financiers or perhaps the start of a Left (Democratic socialist) campaign against the wealthy established classes in this and other European countries? Let’s have outward looking internationalist (ethical) policies and join in solidarity for a better now and future for our colleagues suffering in Greece. I very much want to be part of the campaign to support the people of Greece, and would be grateful to be told how to be involved.